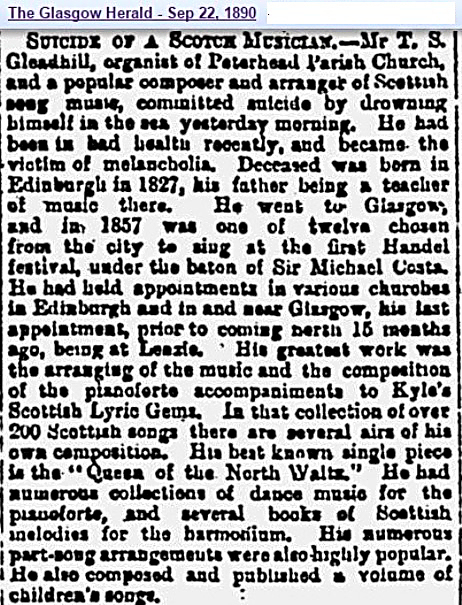 Thomas Swift GLEADHILL (1827-90) was a Teacher and an Editor of music in Edinburgh. He also wrote a version of Waltzing Matilda about 1850. Thomas, born in 1827 in Edinburgh, never married, and latterly, after his career as a distinguished professor and arranger of music ended he was appointed organist at Peterhead Parish Church in 1899. Thomas was the eldest child of a music teacher Anne Finlay of Edinburgh and Benjamin Gleadhill, [A Professor of Music from Derbyshire, England]. Thomas had three sisters, Anne, Martha and Margaret, and one brother, Robert. Readers can follow the course of Thomas' life as recorded here as a genealogy file. So numerous are the compilations of the Songs of Scotland, that it may be egotism on my part to offer a new collection in the hope of creating a demand sufficient to repay the outlay; but to me this “gathering of the flowers of melody” has been a labour of love. I have watched its progress to completion with parental care, and although, in comparison to some of “richer girt,” my offering may not appear “a thing of beauty,” yet to some I trust it may prove “a joy for ever;” for the music of our leal land is not the luxury of the few, but one of the daily wants of the many. From the plough and the loom, what bright gems of thought have illumined our undying strains, for second only in popularity to the lyrics of Burns are the songs of Robert Tannahill, the Paisley poet, a delicate and sensitive bard, who passed prematurely behind the “cloud of oblivion.” Then from the Shepherd’s fold came the name of James Hogg; but he, unlike many of our songwriters, spent a long and happy life. It would require space beyond my purpose to notice in detail all the successful songsters that pass before my mind’s eye, but “till all time” generations will remember such names as Sir Walter Scott, Thomas Campbell, Allan Cunningham, Henry Scott Riddell, John Stuart-Blackie, William Thom, Joanna Baillie, Lady Nairne, and others of the brilliant rank of Scotia’s sons and daughters of song. Of the antiquity of the music of Scotland we have every proof—and there is no question but we owe many of our best old melodies to wandering minstrels who, long before “the iron age,” were wont to roam from hill to vale, and from the laird and the cottar met with a lowin' swelcome. I believe with Eliza Cook, the Queen poetess of England, that “music is born with us, and forms one of the links of divinity.” It is strange how the same melody will affect a dozen different persons in a dozen distinct ways; the Highlander, whose fresh mountain nature is incorporated with the pibroch and reel, moves very differently to the strains of Tullochgorum, compared to the ball-room “Dundreary” who listens to the measure as he would to the guessing of “a widdle.” Then who does not know the softening power of the music of the human voice? It is like the angel whisperings of kind words in the hour of trouble. “Sing on.” Sing to the wicked man, sing to the sufferer, sing to the old, sing to the young, for music will inspire them all. Of Scottish music it has well been said — “Through the force of novelty, or the peculiar powers of some favourite singer, one new song after another becomes the rage of the day, which in a short time is laid aside to be remembered no more. It bloomed but to wither, was born but to die; but our old national airs are imperishable plants, unfading evergreens, which have no more to dread from the capricious innovations of fashion than the oak has to fear from the storm which, instead of overturning, serves but to fix it more deeply in its native earth.” And such marked praise is well deserved, for, take our songs “all in all,” where can we find such happy humour, pure pathos, true tenderness, and soul-stirring spirit, as in the lays of our northern enchanters, wedded as they are to music as healthful as the breath of spring, as plaintive as the sighing of the wind, and as cheery “as sunshine to the flowers in May”?